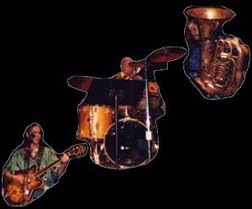 TUBACZAR is a musical trio that spotlights the unique electronic colorings and tuba mastery of David Grego and features Clive Smith's compositions, guitar, keyboard and vocal work while being driven by the powerful percussive forces of Bill Weisbach. David plays his customized 1/4 tone tuba through a battery of electronics allowing him to venture into sonic realms not normally associated with the tuba. Meanwhile, Clive creates unusual electronic textures of his own through his unorthodox processing of his electric guitar, and Bill navigates seemingly effortlessly through the often rhythmically-challenging waters. Expect to see the first TUBACZAR album in the spring of 2019. This site will keep you posted on the release date as well as on live dates.